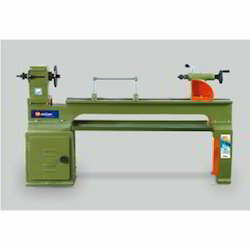 Offering you a complete choice of products which include wood turning lathe machine. Length of bed 1370 mm/54" - 2635 mm/96"
Width of bed 215 mm / 8"
Height of centres 165 mm/6" - 203 mm/8"
Being the leading names in the industry, we offer a wide array of Wood Turning Lathe Machine that is acclaimed for high quality and durable standards. Length of bed 1370/54" 1825/72" 2635/96"
Width of bed 215/8" 215/8" 215/8"
Hight of centers 165/6" 203/8" 203/8"